April 1917. 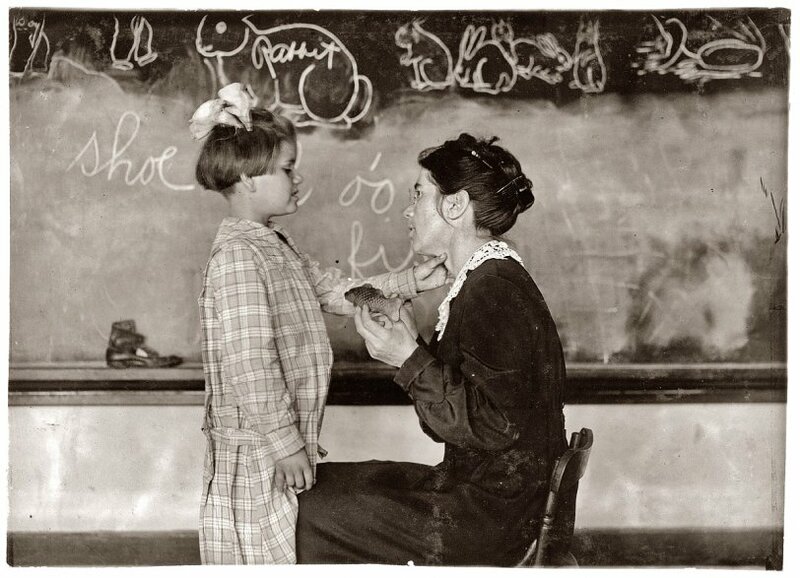 "Teaching a deaf-mute to talk. Training School for Deaf Mutes. Sulphur, Oklahoma." View full size. Photograph by Lewis Wickes Hine. Submitted by kooshy on Thu, 07/05/2007 - 9:42pm. We say that here on the west coast too. Submitted by Anonymous Tipster on Sat, 06/16/2007 - 2:32pm. Submitted by Ron on Sat, 06/16/2007 - 2:29pm. Submitted by Jacob Tomaw on Sat, 06/16/2007 - 2:22pm. Pretty common word in Indiana and Illinois. I always assumed it was standard english. Is it not? Submitted by Anonymous Tipster on Sat, 06/16/2007 - 9:36am. I wonder what a "and whatnot" is? Submitted by Anonymous Tipster on Thu, 06/14/2007 - 1:55pm. ...if the teacher drew the rabbits & whatnot on the blackboard? They are really well done! Submitted by Ron on Wed, 06/13/2007 - 7:32pm. It looks like this girl really wants to learn, you can see the teacher student connection, is this Hine or is my impression right?